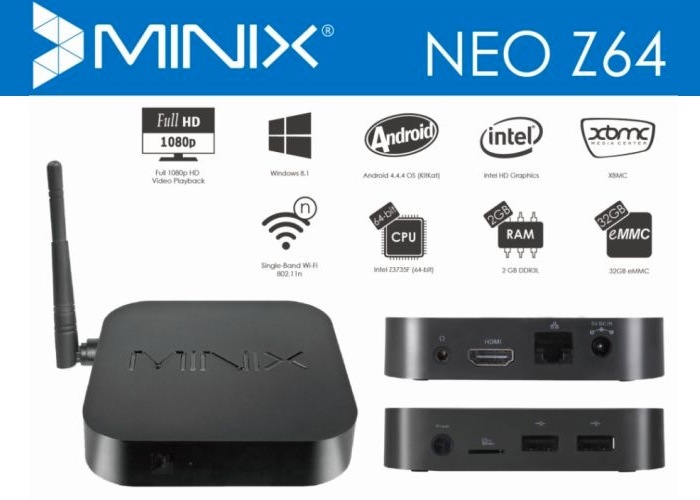 When first unveiled back during September of last year the new Minix Neo Z64 mini PC system was expected to launch and be available to purchase for around $129. This month the new fanless Minix Neo Z64 system is now available but is priced slightly higher than the first indicated prices and is now available to purchase priced at around $159 an increase of $30 from the original price. The Minix Neo Z64 mini PC has been designed to provide users with a low-power system that is equipped with a 64-bit Intel Z3735F Quad Core processor supported by 2GB DDR3L of RAM and Intel HD graphics. Internal memory in the system is provided by a 32GB solid state disk (SSD) and other features include a microSD card slot for further expansion, and an HDMI 1.4 port. With connectivity provided by 80.211n WiFi, Bluetooth 4.0, and 10/100 Ethernet. To learn more about the new Minix Neo Z64 system watch the videos below which have been created by Geek Buying to provide you with a greater knowledge of the build quality and features you can expect from the fanless mini PC, that is now available to purchase online and comes supplied running Google’s Android Kitkat 4.4.4 operating system.